Whitby RUFC boss Ste Mothersdale is hoping his side can pull off a great escape and avoid relegation from the top flight of the Saturday League. The basement club were hit by a six-point deduction just before the festive break to leave them rooted to the foot of the table with -3 points, 10 points adrift of safety. Rugby Club almost resigned from the league early in the season on due to a lack of players, but many have returned to the fold. Mothersdale said: “We have got a lot of the lads who left during the summer back in the team now, our top scorer from last season Paul Jobling is back so that is a huge boost. Tomorrow’s game, weather permitting, sees Rugby Club start the new year with a tough home game against league leaders - and defending champions - Newlands Park. Mothersdale has been imprssed with some of the new faces that have been brought in this season. “I have had to to sign a few young lads, and Joe Crowther, who used to play for Scarborough Athletic under-19s, has been a big hit in midfield. Mothersdale’s troops are still looking for their first win of the season, but the boss believes once they get a win they could regain their confidence and battle their way out of trouble in their remaining 10 league games. 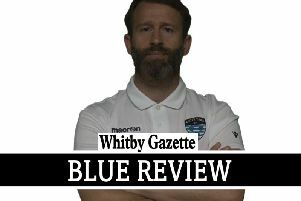 Whitby Fishermen’s Society will be looking to book their place in the final four of the Coastal Shellfish League Cup with a win at third division Itis Itis Rovers tomorrow. Sleights are set to make the trip south to face relegation-battlers Cayton Corinthians tomorrow afternoon. The Sleights second team are also due to be in action in the Scarborough area tomorrow, as they face Division Three promotion rivals FC Rosette at Scalby School. The Scarborough side’s pitch often struggles in the wet weather so the game may well be switched if it has not recovered from the recent downpours. Fishburn Park Reserves will be aiming to pull away from the foot of the Division Three table, as they are at Sherburn. Fylingdales are due to be in action at home to second-placed Heslerton in the Scarborough News Sunday League’s Senior Cup this weekend. The hosts will be hoping to repeat their result when the teams last met on November 8, Dales cruising to a surprise 7-0 success. This was the last match the villagers played before the wet weather ruined the fixture schedule. FILO are at home to lcoal rivals Fylingdales Reserves in the Goalsports Trophy. Les brown’s side have been on top form in their debut season and look favourites to secure promotion to the top flight, but Fylingdales’ second string put up a good display in their 5-3 loss to Heslerton in the Kenward Cup so they may give Filo a few worries.